Top tips from a competitive athlete & personal trainer! This week we have a real treat for you! Our guest poster Sarah Halkon is one of the UK’s most accomplished competitive athletes. That’s not all; she’s also a highly successful personal trainer! Sarah knows exactly what it takes to make, keep and stick to your fitness goals. She's graced the international bodybuilding stage many times to compete against the nation’s best fitness pros. Sarah was first inspired to pursue bodybuilding at the age of 20 and in just 4 short years has achieved 1st place in many major UK competitions. Her discipline and dedication to achieving her dreams has totally transformed her body and made her a leading light in the blossoming female bodybuilding scene. Sarah shows us all that becoming a strong, successful and fulfilled woman is possible for all of us if we put our minds to it. In this post Sarah is going to give you some excellent pointers for how you can stick to your January fitness goals and make your time in the gym rewarding and long lived. We all begin the year with our best intentions, often with the shared goal of being fit, healthy, toning up or losing that winter fluff. Time and time again I see people fall off the wagon despite having the correct motivation and will power - often life just gets in the way. There are a few core principles which I ensure my clients understand in order for them to meet their New Year’s goals and keep on the right path to health and fitness. Following a specific diet plan is one of the most successful ways in which you can keep in control of your goals. Having a plan to follow means you can stay in control of what you eat, as all your meals will be prepared in advance and portion controlled. Second guessing food and trying to count calories in the shop is not only laborious, it’s ineffective and will kill your motivation. Having a tailored plan made up for you by a nutritionist or your trainer will set you up perfectly to meet your fitness goals. The Beurer DS61 Nutritional Analysis Scale will take all the guesswork out of you eating plan! A goal is highly significant when it comes to sticking to your January fitness plans. This can be anything from looking your best at a special event or family get together, or achieving a big fitness goal like a 10k. It’s so important to have a specific thing to aim for because this will keep your mind on track and your motivation firmly in place, and of course goals are there to be exceeded. Short-term goals lead to long-term goals! Be realistic with how many times you can work out per week, be it twice or five times. Set your times to work out and stick to them; you may be a busy mum or have a career where you work long hours - try going for a timed run on an evening or waking up half an hour early to do your workout dvd while the kids are asleep. We recommend Jill Miller's Yoga Tune Up Coregeous DVD as a great way to get toned abs and increase your flexibility. Having a mentally stimulating environment to workout in will always help, be it the gym, a run around the park or a walk through nature. Getting away from your normal surroundings really helps to keep your brain interested and engaged in what you’re doing. Choice of activity is vital too – if you’re struggling to get into running and find yourself coming up with excuses not put your trainers on then try cycling or weightlifting. There’s a type of exercise for everyone and trying lots of things while you discover what yours is will be part of the fun! We all have bad days - even I struggle to get going sometimes. It’s important not to beat yourself up about them or think you’ve failed – you’re human and sometimes circumstances just mean you don’t have the ability to stick to your plan. Schedule in a cheat day or meal into your diet and training regime and this will give you the release you want and something to look forward to. When meals out and boxset binges are a treat rather than an everyday thing they’re so much more rewarding! Keeping a diary of your eating and fitness will help you endlessly, whether it’s with a fitness tracker, an app or a notebook. If you have a personal trainer they are likely to encourage this in order to see your progress and alter things accordingly for you. Whether it’s your body measurements, your running pace or the amount of weight you can lift, being able to see the facts about how much of a difference all your hard work is making is incredibly satisfying. Tracking your blood pressure with a blood pressure monitor is also a great way to see real results from your workout! Sadly, something I see a lot of is people failing to complete their fitness regime for no reason other than their friend couldn’t make it to the gym or couldn’t come for a run, etc. You alone are responsible for your own journey and you can only rely on yourself. You have to find the courage to do it on your own and you will reap the rewards; don’t let anyone else be responsible for letting your goals slip away! There’s no shortcut to fitness, but by letting go of your old, harmful habits and gradually replacing them with new ones you’ll feel healthier and happier for life. I’m living proof that when you make that commitment to changing for the better you can achieve anything you set your heart to! You can perform these 5 moves anywhere, be it the gym or the comfort of your own home. The squat is a compound, full body exercise which exercises primarily the muscles of your thighs, hips, buttocks, quadriceps and hamstrings. Try adding a dumbbell for an extra burn. 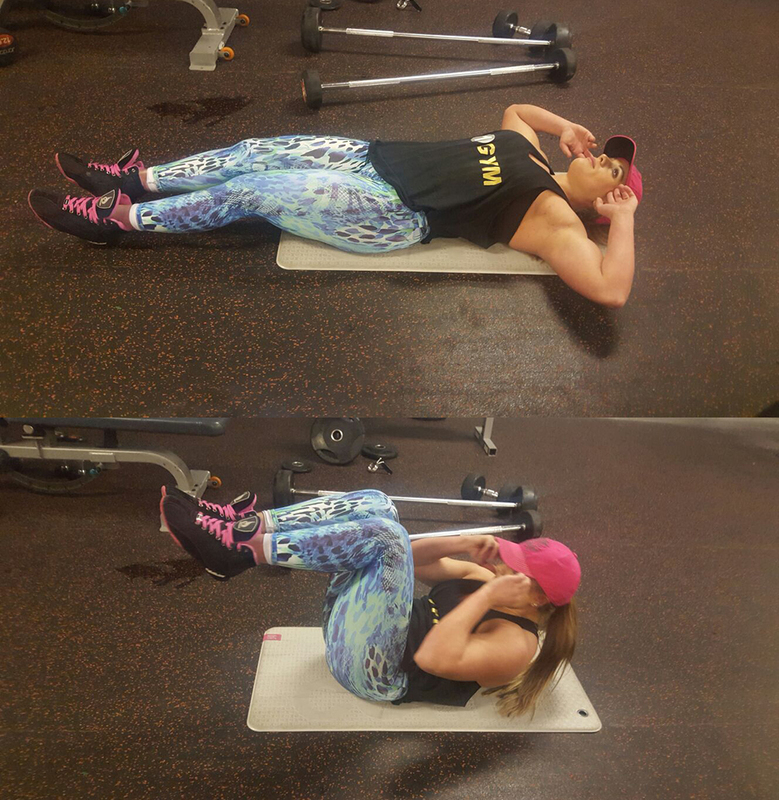 The crunch works out your abdominal and your obliques giving you a beautifully toned midsection. To adapt this exercise you can also use an ab trainer machine such as the Tua Trainer. The push up is a fantastic upper body exercise which targets a huge array of muscles including the deltoids, triceps, pectoralis, abdominals, and the serratus anterior. If you haven't got a comfortable surface you can always invest in a good fitness mat. Another super compound movement is the bent over barbell row. This move works your lats, rhomboids, rear delts, traps, and even your biceps. Now here's more of an intermediate compound movement, the clean and press. Other Muscles: This move works your abdominals, calves, glutes, hamstrings ,lower back, middle back, quadriceps, shoulders, traps and triceps so it's an excellent move to really give you a total body burn!